Why keep plants indoors? They make a lovely addition to any home! Plants absorb carbon dioxide and release oxygen, just what you need when you are cooped up all winter. Houseplants can help provide better air quality and can increase the humidity when the air is dry. 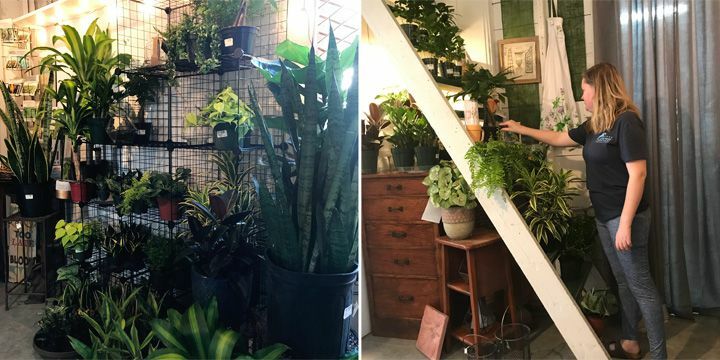 Besides looking good, there is scientific evidence that they make us feel good, so why not have a few houseplants? Here are tips on taking care of the 10 easy care varieties we currently carry in our gift shop. 1. Fiddle Leaf Fig Ficus – The big, violin-shaped leaves of this houseplant are seen on the pages of magazines. Keep in bright, consistent light, preferably a sunny window. Turn the plant once it starts to lean towards the window. Water when the soil is dry to the touch. 2. Coffee Plant – Growing best in bright, indirect light, keep this plant away from drafts. The soil should stay moist but not soggy. Yes, this is the same plant that grows coffee beans, but without pollination after 3-5 years growth, do not expect to be roasting your own beans. 3. ZZ Plant – The perfect plant for newbies and brown thumbs, the ZZ plant is best left alone. Provide low levels of light, avoiding direct sunlight on these oval, waxy leaves. Allow the soil to become dry and do not overwater. 4. Dracaena Cane or Corn Plant – The sword-shaped leaves on this easy-growing plant make a great show and respond well to pruning. Place dracaena in indirect, bright light, such as near a sheer curtain by a sunny window. Water at the cane base, keeping it slightly dry. Note this plant is toxic to dogs and cats. 5. Philodendron Lemon – Place in bright, indirect light, allowing the topsoil to dry between watering. Give this vining plant elbow room to spread. Philodendrons are known to adapt easily to conditions in a home and don’t stress as easily when taken outdoors for summer sunshine. 6. Sansevieria – Known as the most tolerant houseplant despite its nicknames of ‘mother-in-law’s tongue’ and ‘snake plant’. Providing bright, filtered light, sansevieria can survive long periods of drought, so it is best to underwater. 7. Money Tree – The Fung Shui practice believes luck will come to the owner of this little plant. Water deep but infrequently. The money tree grows best in full, bright light. Increase the humidity by placing the pot on a saucer full of pebbles, filled with water. 8. Ferns – Mimic the dappled light of the woodlands by placing ferns near a window that gets morning or late afternoon sun. Evenly moisten the soil, without letting it dry out between watering. Ferns like to be pampered a bit and kept away from dry air and temperature extremes. Use the saucer of pebbles mentioned above for humidity, and even misting with tepid, distilled water would keep ferns content. 9. Hoya – All hoya plants need very little water. Water when the soil is almost dry. During the winter, water all varieties of hoya plants even less. They prefer bright light in a south facing window but can adapt to east and west exposure. It may produce clusters of star-shaped waxy flowers but only if it gets enough light. If kept in low light, it will probably not flower. 10. Ficus Elastica Burgandy or Rubber Plant – These plants like a brightly lit spot but out of direct sunlight. Water when the soil becomes slightly dry to the touch and make sure the pot has drainage holes so that excess water can drain out. The worst thing you can do is water it too much.